The neighborhood borders Lake Michigan and the factories shown billowing smoke in the picture above have long ago been replaced with far more modern industry. Portions of the neighborhood fell into disrepair beginning in the 1970s as the entire Midwest began to adjust to the changes in heavy industry, but a recent resurgence of the neighborhood has been lead by chef-led restaurants, craft beer bars and craft brewers. Thankfully, much of the architectural identity of the area has not only been retained, but highlighted. Honeypie was opened in 2009 and from the very beginning our goal has been to make great, Midwestern-inspired food from scratch. From our pickles to our pie crust we believe that good food is rooted in the way our grandparents used to cook. Real food made by hand with real ingredients. We use as many local meats, produce and other ingredients as we can. In fact, the majority of our ingredients at Honeypie are sourced from Wisconsin. Pork Fries – thin cut french fried potatoes topped with succulent shredded pork, a decadently rich and creamy cheese sauce, and green onions. Mac & Cheese – Just because we can never get enough of that decadently creamy cheese sauce, we went with bacon topped macaroni. Hot Brown – Thick sliced toast is topped with sliced turkey and then loaded with a mushroom cream sauce and topped with dressed arugula. More an open faced turkey sandwich than the classic Louisville Hot Brown, but still comfort food in the very best sense. Burger – A return of the fries, but this time as the side show to the main attraction, a burger of Wisconsin grass fed brisket, fresh ground, topped with cheese, bacon, and a dripping sunny side up egg. Impossible to eat with any delicacy, it’s so good you will end up just mopping up bits of goodness with the house made, brioche bun. More recent menu offerings have included the Cornish Pasty, house-made pretzels with aged-cheddar beer cheese sauce, and chicken pot pie. All items we have featured here as well. They also serve a wide array of award-winning pies, so keep that in mind as you order. The menu at Honeypie definitely brings a fair amount of global fusion, and it seems that same sense of culinary adventure infuses even their local offerings, which fits them into our vision of Great Lakes Cuisine. Much like the Bayview neighborhood, the cuisine of Honeypie has adapted to new flavors and new approaches with out loosing the character of long-standing traditions from the area. “Morel Restaurant is a modern American farm-to-table restaurant that finds inspiration from Chef Jonathan Manyo’s roots: Wisconsin. Morel explores natural flavors, colors and textures from local farms, purveyors, foragers and artisans. The menu the night we stopped in was inspired by local foods, many of the dishes were modern American. We ordered the pheasant terrine, the duck confit, and a beautiful dish of sauteed mushrooms over polenta. Each dish was thoughtfully composed and full flavored. The mushroom dish inspired an attempt at reproducing it the next weekend at home, as a vehicle for serving pulled pork. We started with whole kernel corn, half of which we shallow fried in corn oil until beginning to turn caramel brown. We then blended fried and non-fried corn together, with just enough chicken broth to allow it to blend. Back into the pan and added grated Sarvecchio Parmesan. The mushrooms are cremini and shitake, sauteed in butter with onions, savory, and oregano. The pork had been roasted for over four hours, studded with pieces of garlic, and covered with fresh oregano and sea salt. It was excellent, but Morel was better. A worthy addition to our collection of Restaurants which exemplify Great Lakes Cuisine. Our recent trip to Minneapolis included a wonderful dining experience at Heyday, led by Chef Jim Christiansen. The setting was intimate, with tables nestled in right next to the open kitchen, and the menu was inventive (the company was excellent as well, but you’ll have to supply your own on that front). We elected to begin with a set of three seafood dishes to share which included a revelatory presentation of Blue Mussels with frozen yogurt, pickled cucumber and dill. The balance of dill with the salt and sour of the dish inspired an almost immediate sense of the ocean. We then moved on to a number of meat dishes. Grilled beef culotte, coal roasted carrots, turnips, and turnip leaf relish. Culotte is essentially a cut of sirloin, also called the sirloin cap, which in this case was cut with the grain, then grilled and served rare. Guinea hen served with pressed beets, fresh wasabi and basil. The compressed beets were sweet with all the full richness of slow roasting, but far firmer in texture. Roasted squab with a raviolo (singular form of ravioli) made from kohlrabi and filled with sour potato, parmesan, and thyme. The flavors on these dishes were unique and incredibly well-balanced. The combination of flavors elevated each dish beyond a mere sum of the parts. Part of that sensibility comes from the time Chef Christiansen spent at Noma, in Denmark, which he credits for creating his awareness of wild foods but also of connecting to the local harvest. Noma has been named the top restaurant in the world four times, so it’s a pretty good place to learn some lessons. But a recent video they published on their site is what really inspired this post. It’s ten minutes, but it is worth watching. They discuss a upcoming change to their restaurant location and format, but more importantly to us at Great Lakes Cuisine, they spend the first four minutes discussing the difficulty in defining cuisine. They discuss their initial vision which included approaches such as using ingredients only from the Nordic “territory”, “distilling [the] landscape onto plates of food”, and using methods of preservation as inspiration. They discuss throughout the video the ideas of seasonality. At the same time, the recognize the somewhat arbitrary nature of defining a cuisine. Discussing issues like where to draw geographic boundaries, what “imported” foods to allow, and how far back one should go into history, they discuss the difficulties with defining what is “authentic”. Here at Great Lakes Cuisine, we have wrestled with the same linguistic, historic, ethnic questions. Why are we comfortable with the sausages, beers, and rye breads from Chicago, but begin to wonder about the fit of deep-dish pizza within our definition? More broadly, why favor the Eastern European, Slavic, and Nordic culinary traditions in our approach over the Italian or Italian-American traditions? Why do we work so hard to avoid citrus in our approach (for fear of introducing a “foreign” flavor) while embracing vinegar made from the newest craft beers? Some of this we have already addressed in our pages on Definition and Ethnic traditions. And some of these issues are exactly the point of what we are doing. We want to inspire the conversation, inspire the questions. These tangle considerations of history, geography, ethnicity, and seasonality are the very point of cuisine. Talking about Napa cuisine, or Tex-Mex, or any regional cuisine is not an objective process. It is inherently subjective. It is not about absolutes, but about inspiration. Though the offerings of Heyday would have to be considered more global than local, we can say without reservation they were a source of inspiration. For that, we thank you. Or, instead of frying, place your steaks upon a gridiron or double wire broiler, well greased, and broil them on both sides; place them on a hot dish, and pour over them melted butter seasoned with salt and cayenne pepper. This mixture of meat is also often spread upon slices of bread, with butter in which a spoonful of dry mustard has been mixed, and used as a sandwich, or it may be served raw and cold with slices of Vienna bread spread with gilt-edged butter. Prepared very similarly to our description from 1883 above. 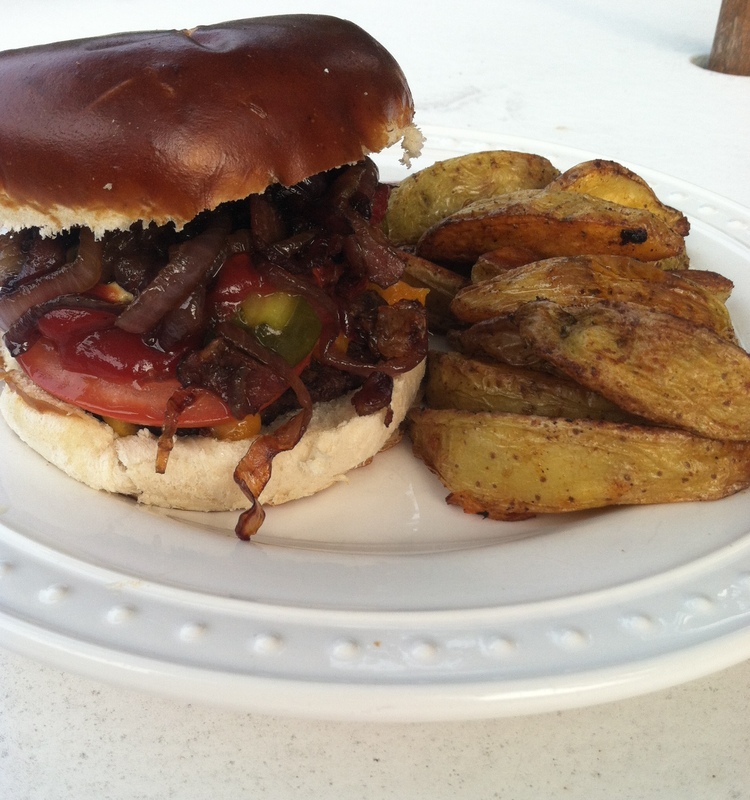 Pretzel bun, malt vinegar caramelized onions. Brie and caramelized onions, from John’s Sandwich Shop in Wauwatosa, WI. Note the broccoli slaw served as a side, delicious. 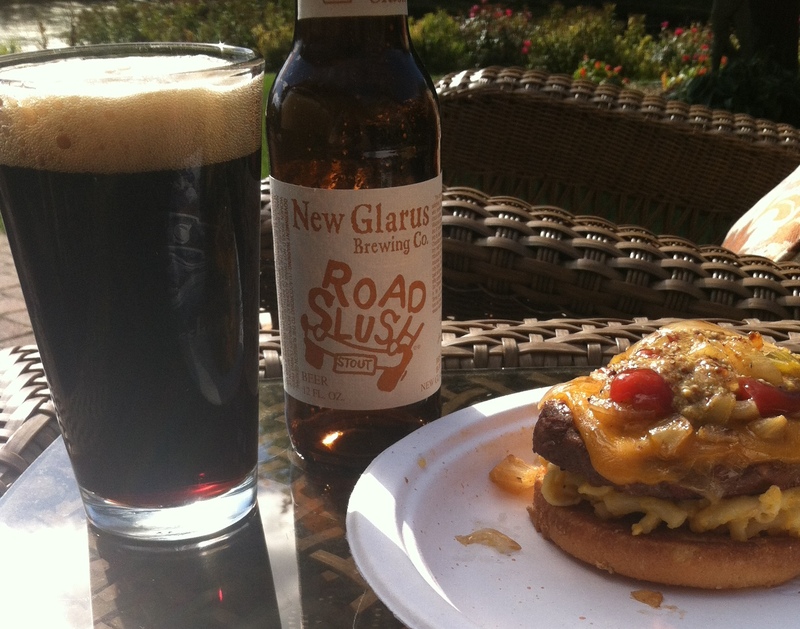 Mac-n-cheeseburger enjoyed with a Road Slush Stout from the fine folks at New Glarus Brewing. Would have been even better with our Ultimate Mac. 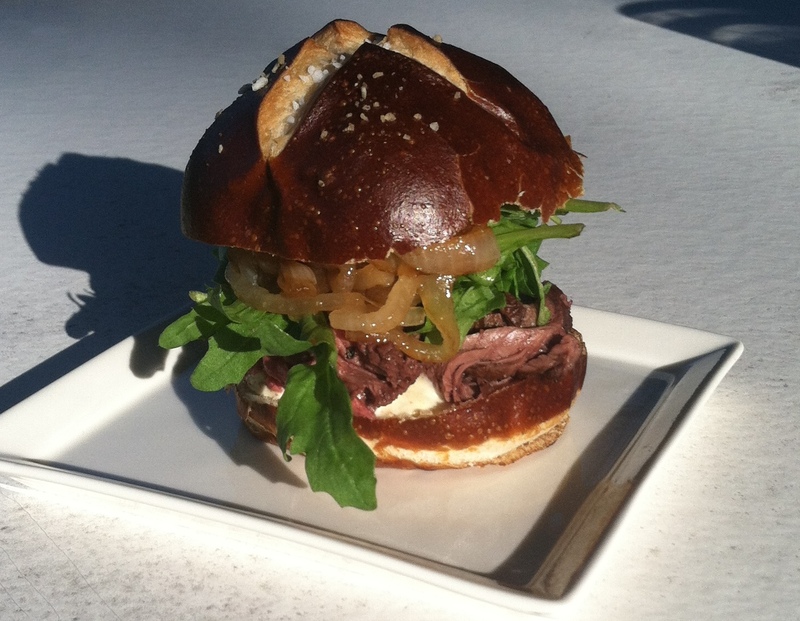 Not even a hamburger – Thin sliced, house roast beef on a pretzel bun with arugula, blue cheese, and malt vinegar caramelized onions. A couple of honorable mentions – We enjoyed a patty melt recently made with a half and half mixture of ground sirloin and bratwurst removed from the casing, topped with our ever-present malt vinegar caramelized onions, shredded Montamore from Sartori Cheese, on marble rye from the folks at Clasen Bakery. Again, not technically a burger, but we’re not getting suddenly technical around here. 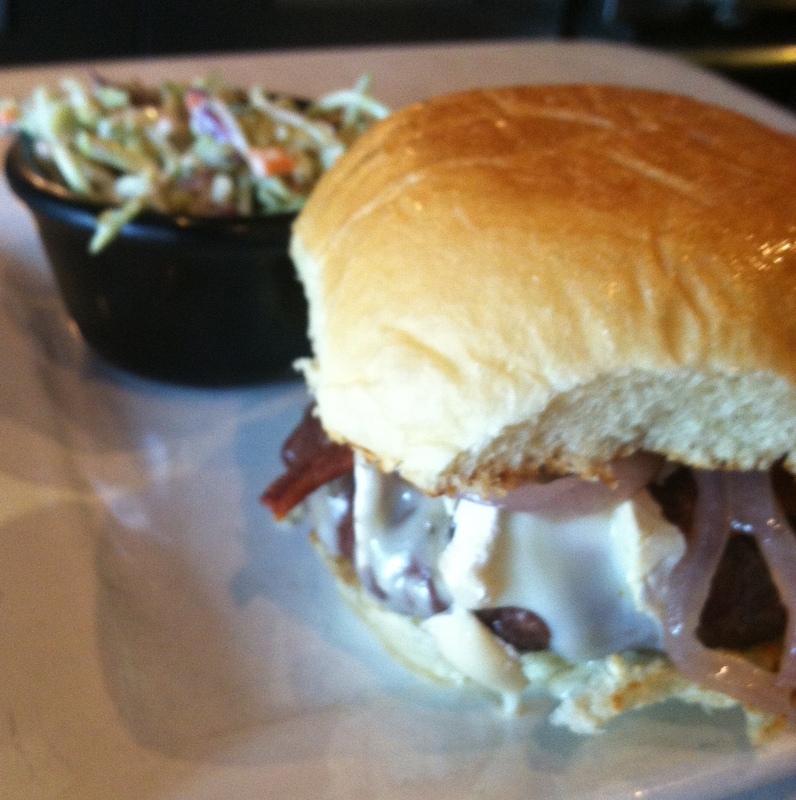 A second honorable mention for a burger inspired by Cafe Bavaria in Wauwatosa, where they have a build-your-own burger option. The menu features a Braunschweiger melt, which is just as it sounds, braunschweiger with melted muenster cheese. We used that as our inspiration and had a Braunschweiger Smashed Burger – 1/3 pound beef patty, braunshweiger, muenster, lagered onions and Dusseldorf mustard on a pretzel bun. The result was “meatiness squared” as the braunschweiger just amped up the burger to another level. Now those last two are pretty representative of our local ethnic traditions, locally produced food, and put together in new ways. Maybe we’re talking about Great Lakes Cuisine here after all. The clouds glowed in the early evening sun, over fields of corn interrupted by occasional groves of old oak trees. We rolled along a winding country road past the barns, faded red. We passed one or two cars as we drive the twenty minutes. The one critical turn from the lake to the town of St. Anna’s is marked by a simple road level sign with an arrow – “Schwarz – 4 Miles”. As we approached, the church steeple rose above the trees. We pulled into the unincorporated town and quite suddenly, there are cars parked on the side of road and two parking lots nearly filled, and groups of four and six walking the sidewalks. All headed to one destination – Schwarz Supper Club. Since 1957, people have flowed into the bar, grabbed a Old Fashioned and a menu. They took our dinner order as I sipped a cocktail and life slowed down to the speed of a conversation between good friends. I’m not sure how long we waited for a table. Could have been 30 minutes, might have been 45. We didn’t really care. The Old Fashioned went down really smooth. Likely because this is a Wisconsin Old Fashioned, not some retro-rye-whiskey-house-made-bitters thing. 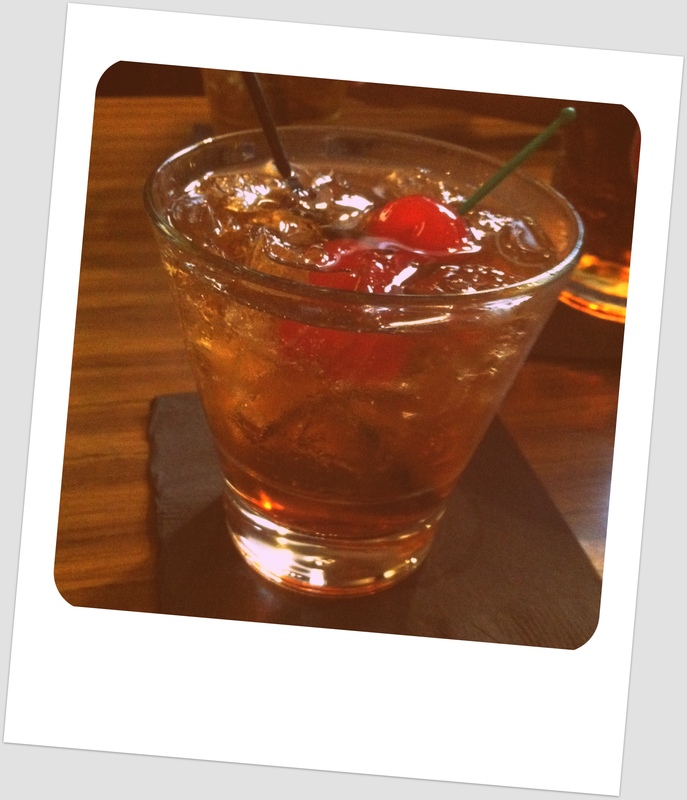 Truth be told, I kind of like the rye whiskey thing, but when in St. Anna’s, just order an Old Fashioned Sweet with cherries, shut up, and drink. We’re not doing a throwback thing here, we’re actually stepping back to the 1950s. So we need some good fried food with our cocktails. 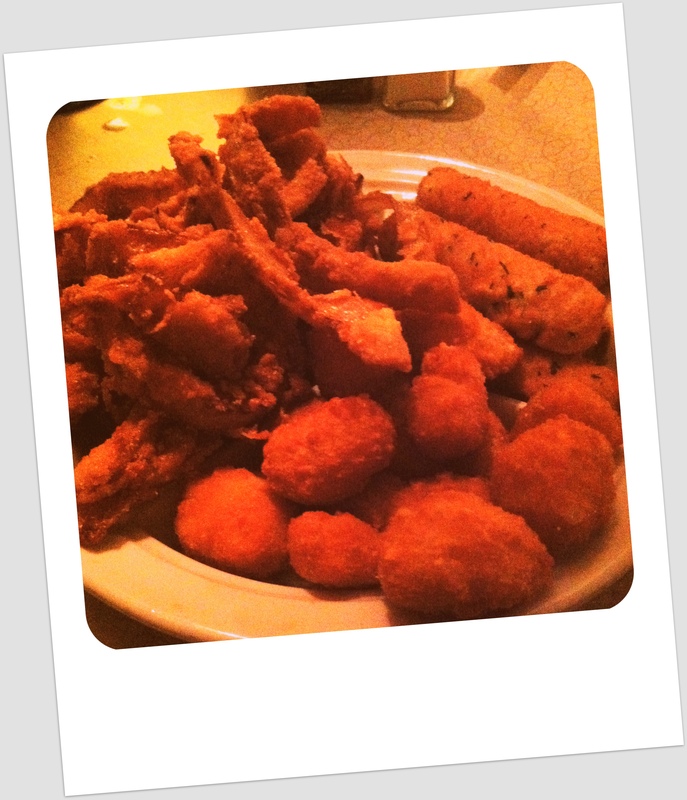 Fried cheese curds, mozzarella sticks, and fried onions fit the bill. Prime rib is the specialty, and apparently they go through quite a bit of over a weekend, but we went with a selection of excellent steaks and some beautiful fried walleye. A standard baked Idaho potato is the only side, which was baked to buttery perfection. There is a couple of books out there celebrating the unique culture of Wisconsin supper clubs. Of the 24 supper clubs featured in “The Supper Club Book” by Garrison Keillor and David Hoekstra, 14 are from Wisconsin. But the true definitive guide is “Wisconsin Supper Clubs: An Old-Fashioned Experience” by Ron Faiola, with over 50 locations detailed. Reading these books is a great place to start, but the supper club experience is all about actually experiencing these restaurants in all their Friday night glory. 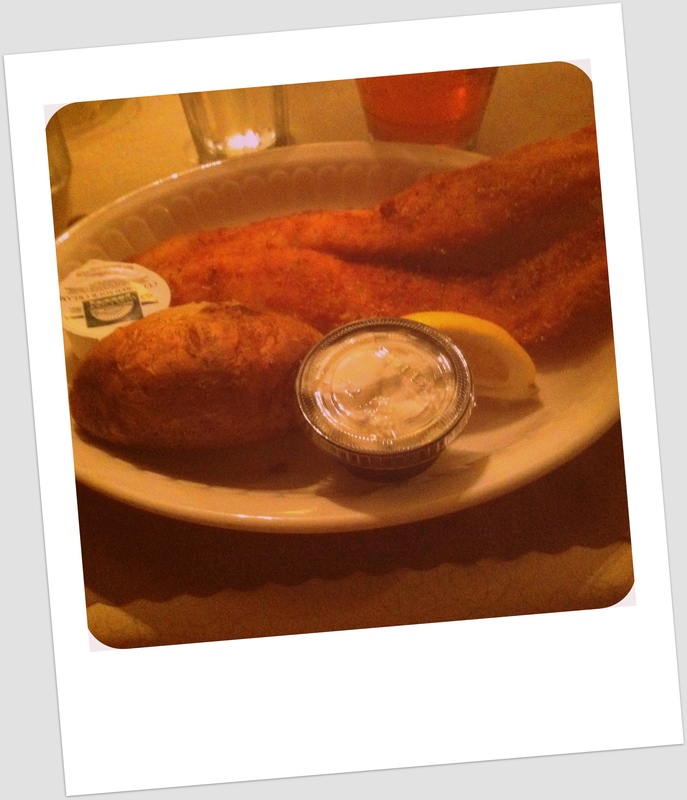 Go at 6 PM, wait as long as it takes to get a table, drink Old Fashioneds in the bar, eat fried food. Above all, go with a group of good friends. Talk about family, and politics, and dreams of the future that glow like a Norman Rockwell painting. These are the good old times. 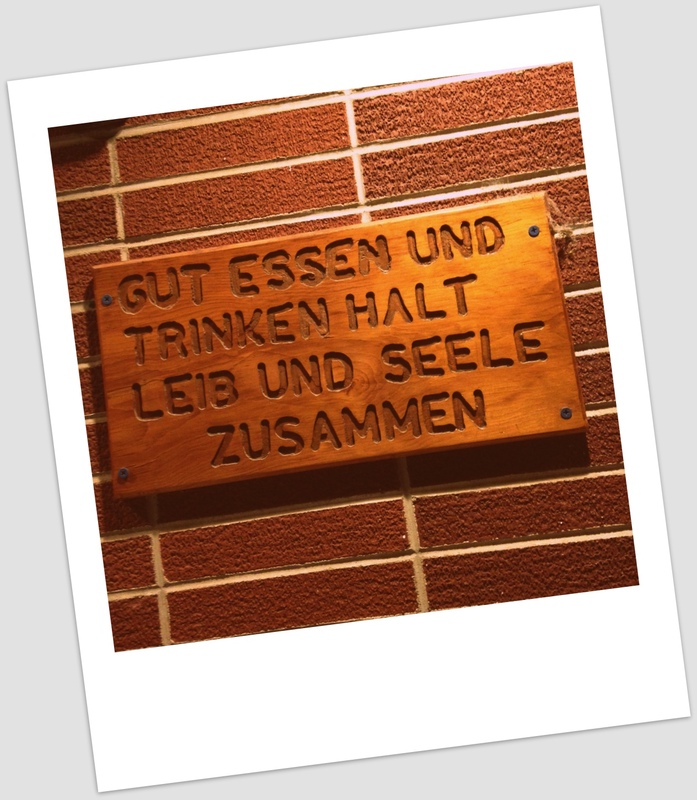 The sign leaving Schwarz’s captures it best: Good food and drink hold body and soul together.